High in vitamins B6 and C, plus fiber, folate, and glutathione, an anti-carcinogen and antioxidant, asparagus is an excellent nutritional choice. It comes in three colors: white, green or purple, although the green variety is the most common. Long considered a luxury vegetable, often with a luxury price tag, fresh American-grown asparagus appears in stores in late February. But asparagus is at its best—and is usually cheapest—in April and May. And sure, while there’s frozen and canned asparagus, which can be enjoyed year round, nothing beats the delicate flavor of fresh asparagus. Asparagus spears can be thick or thin. Some people prefer one kind over another but size is not necessarily an indicator of quality. Thicker spears may have tougher, woodier ends, but these are broken off before cooking anyway. The key is to select straight, firm, uniformly sized spears with closed tips. Since asparagus deteriorates rapidly, it’s important to select bundles that are refrigerated or on ice. For the same reason, asparagus should be used within two or three days of purchase, preferably sooner. If you do need to keep it for a day or two, the best way is to place the spears upright in a bowl (or even a small vase) of cold water. Alternatively, you can wrap the ends of the spears in a damp paper towel and refrigerate them. To prepare asparagus, you will need to rinse the spears and break off the tough ends. After that, how you cook asparagus is up to you. Purists enjoy their asparagus with nothing more than a drizzle of good-quality olive oil, but you can enjoy asparagus in many different dishes: in soups, salads, stir-fries, risottos, scrambled eggs, pasta, and many more dishes besides. You can find some great low-fat recipe ideas below. Steaming: First, you need to tie a bundle of asparagus spears together with kitchen string, just under the tips and also near the bottom, making sure the bottom ends are level. Place the bundle in a tall pot of 2 inches of boiling water, unless you have your very own asparagus steamer. Cover and steam for 5-8 minutes, depending on the thickness of the spears. While the ends of the asparagus are being boiled, the tips are actually being steamed. The end result should be bright green, crisp yet tender spears. Boiling: Lay the asparagus spears in a large skillet with about an inch of water. Boil for up to 5 minutes, depending on thickness of the spears. 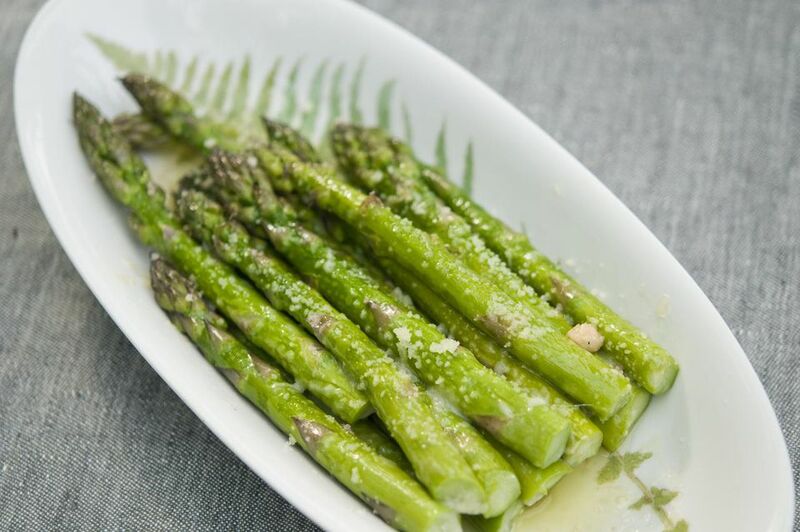 Blanching: If you are using the asparagus in salads or for other cold dishes, plunging the boiled or steamed asparagus in cold or iced water as soon as they are done immediately stops the cooking process and helps preserve the color and crispness of the asparagus. Microwaving: Lay asparagus in a microwave-safe baking dish, with tips towards the center. Add about a 1/4 cup of water; cover and microwave for 4-5 minutes. Roasting: Preheat oven to 450 degrees. Lay asparagus on a baking sheet. Drizzle with a tablespoon of olive oil. Roast for 8-10 minutes. Stir Frying: Cut spears diagonally into 1 1/2 inch to 2-inch pieces, and stir fry with a teaspoon of sesame or olive oil for 3 minutes. Roasting: Place asparagus on a baking sheet coated with nonstick cooking spray and roast in a preheated 450-degree oven for about 10-15 minutes, depending on thickness of the spears. Or, instead of using cooking spray, drizzle a little olive oil over the asparagus before roasting. Grilling: Place asparagus spears on a preheated (medium-high heat) grill sprayed with olive oil spray and cook for about 5-8 minutes until tender, turning occasionally.